A hot glass of milk pepped with aromatic spices and herbs can be very comforting and healthy. It can soothe your senses and give you instant relief from a bad cold. 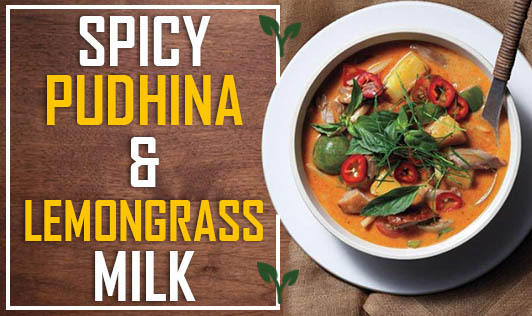 Lemongrass and pudhina are rich in vitamin C, which help to improve immunity and prevent infections and cold. • Take 2 cups of water in a vessel, add lemon grass stalks, mint leaves and sugar to it, stir well and boil. • Simmer for 5 to 10 minutes, till you get the aroma and the water reduces to half. • Add the grated ginger and chai masala, stir well, and boil on low flame for a minute. • Now add the milk and simmer on low flame for 4 to 5 minutes, while stirring in between. • Add the turmeric powder, mix well, and boil on low flame for a minute. • Switch of the gas and strain the milk using a strainer. • Pour into glasses and serve hot.